Two visits to Rainham Marshes RSPB over the weekend, and a wintry feel to the place. Lots of Gulls around the Stone Barges/landfill but I couldn't pick out any of the scarcities. Peregrine flew over on Saturday and nearby Wennington Marsh held at least 3 cc Marsh Harriers with 2 circling Buzzards on the same day. Stonechats and Cetti's Warblers added to the mix and Song Thrushes and Redwings were particularly evident. Sunday was WeBs count day and I covered the shoreline from just west of Stone Barges down to the RSPB centre. 200 Redshank, 15 Black-tailed Godwits, Ruff, Snipe and Curlew were seen with a variety of ducks, but, the above were, perhaps, overshadowed by 4 Egyptian Geese flying up river between Aveley Bay and Coldharbour Point. On the reserve over 200 Dunlin graced Purfleet Scrape alongside lots of Snipe, Lapwing and Golden Plover. This scrape, viewable from the centre is coming into its own. 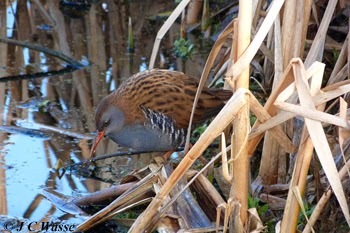 Along the northern boardwalk the Water Rail in the photo was showing nicely on Sunday attracting loads of regulars and visitors alike. Several Rock Pipits along the shoreline between Stone Barges and the RSPB centre and a smart Water Pipit showing and calling near Coldharbour Point. A subtle 'wist' compared with the 'weest' of the "Rockit".